Welcome to M.D. Graphics Pvt. Ltd. Manufacturer & Supplier of Metal & Self Adhesive Labels An ISO 9001:2008 certified company, Established in the year 2007. We have spread our wingsto South East Asia & East Asia and we are supported by Modern Infrastructure & well developed R& D units. Excellent pre delivery inspections, innovative designs & Cost effective prices are the strengths of our organization. Our product range includes Polycarbonate & Anodized Metal Printed Labels. 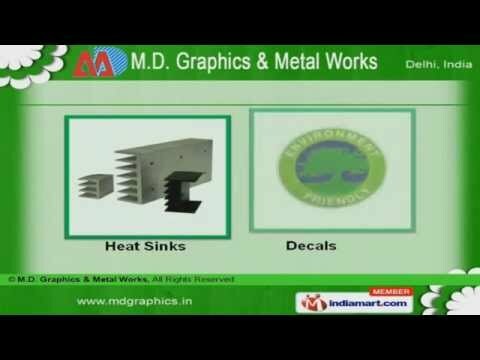 Heat Sinks & Decals offered by us are well known for their optimum performance and long service life. We offer a qualitative range of Paper Sticker & Etched Label. Our Dome Label & Digital Sign Board Banners are widely appreciated in the market. We also provide Operation Manuals & Mirror Aluminium Labels are designed keeping in mind the specific needs of clients and are available at most affordable prices. Along with that we offer PC & Anodized Printed Aluminium Labels that are a class apart.